We were minding our own business when suddenly we were ATTACKED BY POPCORN. What a mess! while we were defending ourselves, poor Peaches was literally flipped in the air..but we found out what had happened. 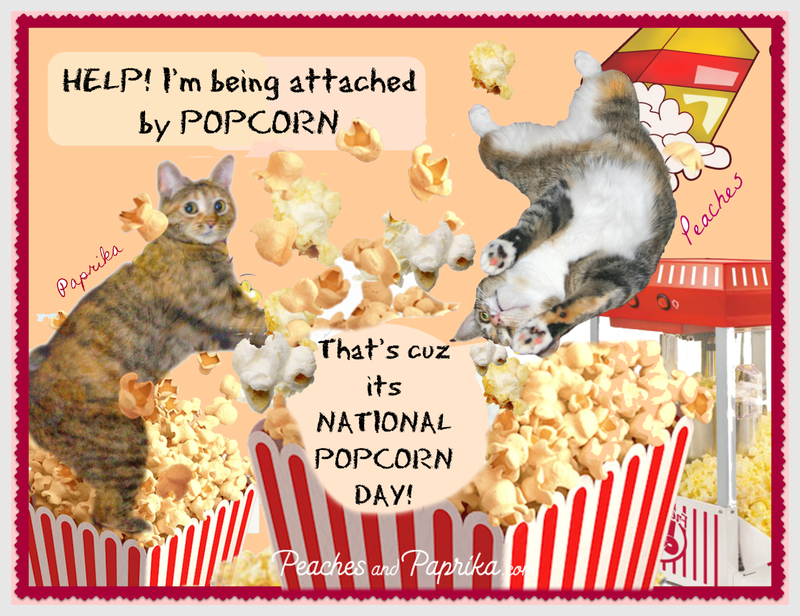 NATIONAL POPCORN DAY, an obscure holiday, had taken us by surprise. But we rose to the occasion! A few kernels hit our noses but we did a great job of self defense! Wishing your humans a happy Popcorn Day. Have some! We do suggest you kitties run like H___ if you see them coming your way though! I love popcorn with lots of butter. Being attacked with buttered popcorn is fine by me. Oh, this made Us laugh! Attacked by popcorn (mol, mol, mol). Popcorn scares Brother Simon when it starts popping! You are such cuties. I want popcorn now. You guys look like caramel popcorn! WoW! Will kettle corn do? TW loves her some kettle corn. Love the art. Never trust popcorn! It changes itself suddenly.